BitArtist.org: Honda Welcome Plaza @ Tokyo (ASIMO Demostration). Honda Welcome Plaza @ Tokyo (ASIMO Demostration). Honda is one of the most admired company in the world, the company slogan is "The Power of Dreams" inspired by Honda's founder: Soichiro Honda. One of the most noticeable research by Honda is the robot: ASIMO (Advanced Step Innovative Mobility), it is nearly a public icon of the company. I went to tokyo last week, and visited the Honda Welcome Plaza which featuring ASIMO demo. I am very happy to see this masterpiece of engineering. Walking like a human, can run, talk, dance, even movement of arm is prefect. It is definely cool. 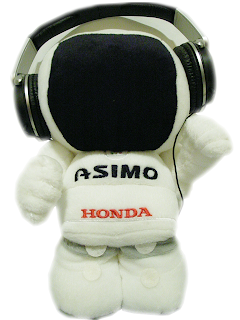 Besides ASIMO, there are motorcyles, cars and also the HondaJet(model only). If you love Honda products, you should really go there to have look when you go to Tokyo. ASIMO - New Artificial Intelligence Demostration. Line Following robot in a mouse.